Baron - 30 Mar 1972 (Conferred 11 May 1972), KG - 26 Apr 1977, GCB - 1 Jan 1962 (KCB - 1 Jan 1961, CB - 1 Jan 1960), CBE - 1 Jan 1946, DSO - 22 Apr 1941, LVO (MVO 4th Class) - 16 Jul 1953, K StJ -: 8 Oct 1976, DFC - 7 Mar 1941, AFC - 1 Jan 1941, MiD - 24 Sep 1941, MiD - 1 Jan 1943, MiD - 14 Jan 1944, MA. (AuxAF): Plt Off: 15 Jan 1935. (RAF): Plt Off: 3 Mar 1936 [3 Dec 1934], Fg Off: 3 Sep 1936 [3 Jun 1936], Flt Lt: 3 Sep 1938 [3 Jun 1938], Act Sqn Ldr: 6 Sep 1939, (T) Sqn Ldr: 1 Mar 1940, Act Wg Cdr: 14 Dec 1940, (T) Wg Cdr: 1 Sep 1941, Sqn Ldr: 14 Apr 1942 [1 Mar 1940], Act Gp Capt: 9 May 1942, Wg Cdr (WS): 9 Nov 1942, Act A/Cdre: 22 Aug 1944, Gp Capt (WS): 22 Feb 1945 - 1 Nov 1947, Wg Cdr: 1 Oct 1946, Gp Capt: 1 Jul 1949, Act A/Cdre: 1 Dec 1953, A/Cdre: 1 Jan 1956, Act AVM: 1 Jan 1957, AVM: 1 Jul 1957, Act AM: 15 Nov 1959, AM: 1 Jul 1960, ACM: 1 Sep 1962, MRAF: 1 Apr 1967. 15 Jan 1935: Appointed to a commission in Auxiliary Air Force as a Pilot Officer. 15 Jan 1935: Pilot, No 600 Sqn AuxAF. 28 Oct 1935: Attached to RAF from AuxAF. 28 Oct 1935: Pilot, No XV Sqn. 3 Mar 1936: Relinquished his commission in the AuxAF. 22 Nov 1937: PA to AOC in C, Bomber Command. 11 Jan 1939: Pilot/Flight Commander, No 108 Sqn. 7 Jun 1940: CFI, No 13 OTU. 26 Aug 1940: 'A' Flight Commander, No 82 Sqn. 14 Dec 1940: Officer Commanding, No 82 Sqn. 6 May 1941: Air Staff - Operations, HQ No 2 Group. 20 Oct 1941: Air Staff - Operations, HQ Bomber Command. 9 May 1942: Group Captain - Operations, HQ Bomber Command. 14 Apr 1943: Supernumerary, RAF Waddington. 16 Apr 1943: Officer Commanding, RAF Waddington. 4 Apr 1944 : HQ Bomber Command Representative to ACM Tedder. 22 Aug 1944: SASO, HQ No 5 Group. 1 Dec 1945: Staff, Central Bombing Establishment. 6 Mar 1947: SASO, No 2 (Indian) Group. 1 Nov 1947: Officer Commanding, RPAF Station, Drigh Road. 23 May 1949: Attended Joint Service Staff College. 19 Dec 1949: Deputy Director of Personnel (2). 5 Dec 1951: Officer Commanding, RAF Tangmere. 13 Mar 1953: Officer Commanding, RAF Odiham. 1 Dec 1953: Commander, Metropolitan Sector. 9 Jan 1956: Attended Imperial Defence College. 1 Jan 1957: Commandant, RAF Staff College - Bracknell. 15 Nov 1959: Deputy Chief of the Air Staff. 3 Aug 1960: C in C, HQ British Forces Arabian Peninsula. 1 Sep 1963: Chief of the Air Staff. 4 Aug 1967: Chief of the Defence Staff. 13 Apr 1971 - 1 Aug 1978: Governor and Constable of Windsor Castle. 7 May 1971: Placed on half pay. Born in New Zealand, he studied Law at Trinity, Cambridge gaining a First Class Honours degree and was called to the Bar, Lincoln's Inn in 1935. However, whilst at University he had enrolled in the RAFO where he learnt to fly before transferring to the Auxiliary Air Force in 1934. Forsaking a career in Law he applied to join the RAF and was accepted for a permanent commission in 1936. Posted to No ? Squadron he flew ? until 1937 when he became PA to AOC in C, Bomber Command. He returned to operations as a Flight Commander on Blenheims and was involved in some of the early low level daylight operations undertaken by No 2 Group. Taking over command of No 82 Sqn in 1941, he continued to build up experience and a reputation for leadership. His operational experience was then put to good use as a Staff Officer at No 2 Group HQ. 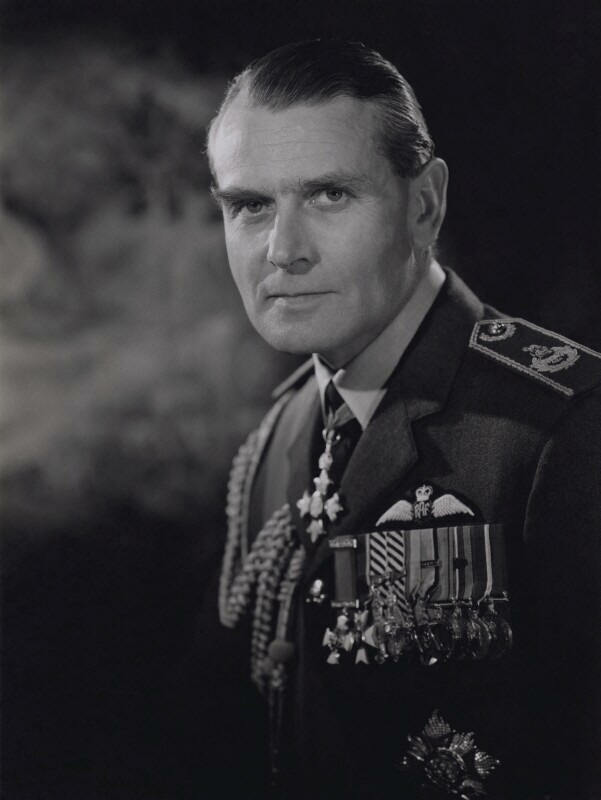 During his tenure as OC at Odiham he was tasked with responsibility of hosting the 1953 Coronation Review on 15 July attended by the recently crowned Queen Elizabeth II as well as the RAF's founding father, Viscount Trenchard, less than three years before the great man's death. Post-war, he progressed steadily, becoming Commandant of the Staff College at Bracknell and later taking command of British Forces Arabian Peninsula in 1960, his success in commanding a unified command led to the formation of further such commands. The first was HQ Middle East Command (Aden) formed on 1 March 1961. Thirty years before the more famous Kuwait crisis he became involved in a lesser known Gulf incident when the Iraqi government of the day made threatening moves towards their neighbour. In 1964, one of his duties as CAS was to lay the foundation stone of the new Trenchard Hall at Cranwell to house the RAF Technical College on its amalgamation with the RAF College in 196?. On retirement from the RAF, he became Constable and Governor of Windsor Castle and two years later Lord Lieutenant of Greater London. He acted as Chairman to the Royal Commission for the Exhibition of 1951, to King Edward VII Hospital for Officer and the Royal Over-Seas League (until 1976). He also served on the Governing bodies of Bradfield College, Wellington College and Marlborough College. He became a Honorary Freeman of The Skinners’ Company in 1968 and for the period 1973 - 74 he was Master of the company . However, he retired from all these activities in 1978, if not before, and returned to his native New Zealand. "I was interested to visit the above page because I had worked with Sam in NZ during the early 1980s. A delightful man. Always insisted on being introduced as Sam Elworthy – none of the airs and graces one might have expected from his career, and, in particular, his close working association with the Royal Family. He met with the Queen on a weekly basis when she was in residence at Windsor, and on one of those occasions seized an opportunity to broach with her his desire to retire to NZ. She responded that his appointment, like that of his predecessors, was one for life, and he was concerned that she seemed a little affronted that he should signal a wish to break that practice. He suggested that he had no wish, like some of his predecessors, to go gaga whilst still in office, or to be seen piddling in corners, and wished to retire gracefully, while in possession of all his faculties. Months(?) passed without further mention of the subject, until the Queen told him, at the end of one of their meetings, that she had decided that, in future, there would be a retirement age of 75(?) set for the Governor of Windsor Castle, but she wanted him to stay as long as he felt able. However, she was prepared to agree his earlier retirement, provided that he agreed to visit her annually and attend the annual Garter Ceremony at Windsor, for so long as he was able. As a footnote to that, Sam had inherited the Garter insignia used by Sir Winston Churchill, and expressed concern at the risk of loss of that insignia, and the cost of its insurance, when undertaking these visits. The Queen resolved these concerns by undertaking to keep the insignia safe for him at Windsor. I am not sure how many times he undertook these visits, but I clearly recall the enthusiasm with which he described a small luncheon hosted by the Queen in June 1981, at which he was seated next to Diana, shortly to marry Charles. He had been most taken with her. I last saw Sam around March 1983, at which time he was still mentally sharp and physically active, but about to reach age 72, requiring his retirement from our business connection. At that time he had recently suffered a broken shoulder as a result of falling from a tree on his rural property that he was pruning with a chainsaw!" “Acting Wing Commander Samuel Charles ELWORTHY, D.F.C., A.F.C.(36056). No.82 Squadron.